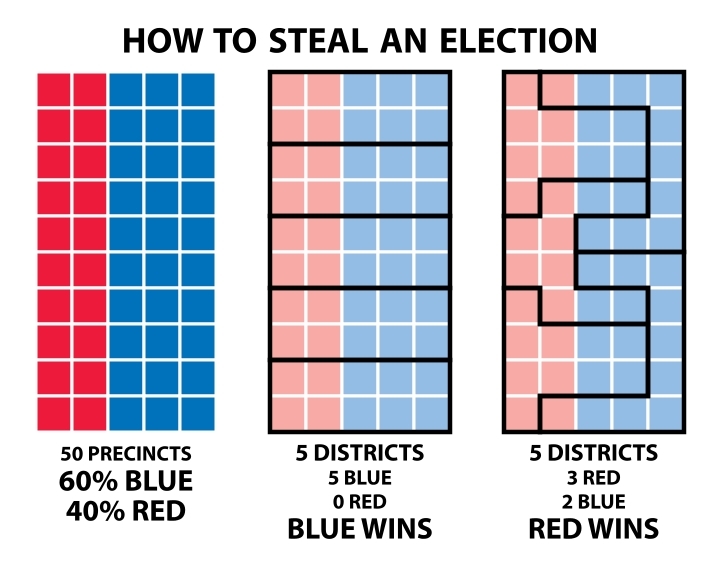 Gerrymandering. Image by Steven Nass (Own work) [CC BY-SA 4.0 (http://creativecommons.org/licenses/by-sa/4.0)], via Wikimedia Commons. Results from last November confirm, once again, that control of the Wisconsin Assembly and Senate depends much less on voter preferences than on Act 43. Passed in 2011 by a Republican-controlled Legislature and signed by a Republican governor, Act 43 redistricted legislative seats to make it very difficult for Democrats to win a majority of the districts. Like other gerrymanders, Act 43 was aimed at making it harder for opponents of the Act’s authors to translate votes into power. In the November election, Republicans won 63 of the 99 Assembly districts (63.6 percent), while Democrats won 36 (36.4 percent). How does the breakdown in number of seats compare to the actual vote totals for candidates? Here, things get a bit complicated. The most common way to make the comparison is to add up the total votes for Assembly candidates across Wisconsin. Doing so gives 1,308,454 (54.2 percent) for Democrats and 1,103,521 (45 percent) for Republican candidates. But these totals give a misleading picture of underlying support for each party’s legislative candidates. Here is the problem with this method: In 38 of the 99 districts, only one of the two major parties fielded a candidate. In 30 of those elections, there was no Republican; the other 8 lacked a Democrat. No doubt, the absence of a candidate was due to a decision there was no chance of winning the district. The missing Republican challengers are a byproduct of the Wisconsin gerrymander. Its design depended on stuffing as many Democrats as possible into as few districts as possible (called “packing”), essentially conceding these districts to Democrats. In exchange the designers were able to create many more districts that heavily favored Republicans (called “cracking”). With no candidate, a party gets no votes in a district. But even the most unbalanced district favoring one party will have some number of voters who favor the other party. This is apparent when looking at voting by district for state-wide candidates. For statewide candidates, a vote from Waukesha County is just as valuable as one from Dane County. Without the votes he got in heavily-Republican Waukesha County, for instance, Democrat Tony Evers would have lost the race for governor. 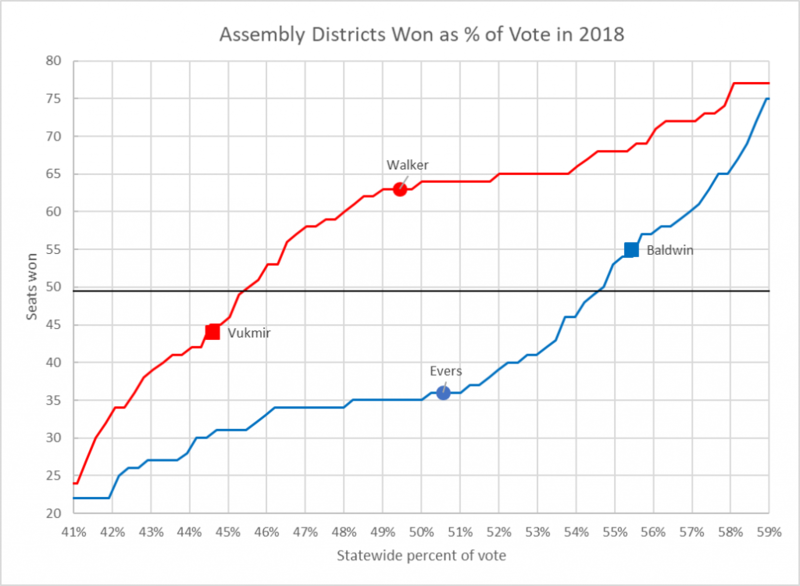 This suggests a way to adjust the raw Assembly vote to get a more accurate picture of statewide sentiment towards Assembly candidates: use statewide results from the governor race (with a 50.6 percent Democratic edge) for districts where one or the other party was missing. Doing so adjusts the total to show suggest that about 52 percent of voters would have voted for Democratic legislators and 48 percent for Republican legislators if both parties had contested every district. The graph below uses that approach to determine how many Assembly seats each party would have won with various percentages of the vote: The red line shows the number of districts (the vertical axis) that Republicans would win while receiving vote totals between 41 percent and 59 percent, and the blue line shows the number that Democrats would win. To take control of the Assembly and win 50 of 99 seats, as the graph shows, Democrats need 54.7 percent of the vote; by contrast, Republicans need support from only 45.5 percent of voters. In the range between winning 41 percent and 59 percent of the votes, Republicans win substantially more districts than Democrats whatever their vote share. You can see how the vote for the candidates for governor and U.S. Senator would have translated to the number of Assembly districts won. Thus, while Evers won 50.6 percent of the two-candidate vote for governor, he carried only 36 of the 99 Assembly districts; whereas Scott Walker’s 49.4 percent of the vote won 63 of the 99 seats. In the US Senate race Tammy Baldwin won 55.4 percent of the vote and 55 of the Assembly districts. Baldwin’s vote percentage was barely enough to flip the Assembly control. But that fell far below what Republicans could have gained with that vote percentage. Republicans winning 55.4 percent of the vote would gain them 68 Assembly districts. In addition, to winning 55 Assembly districts, a flip of 19, Baldwin won 18 state Senate districts, flipping six. Where did her additional votes come from? 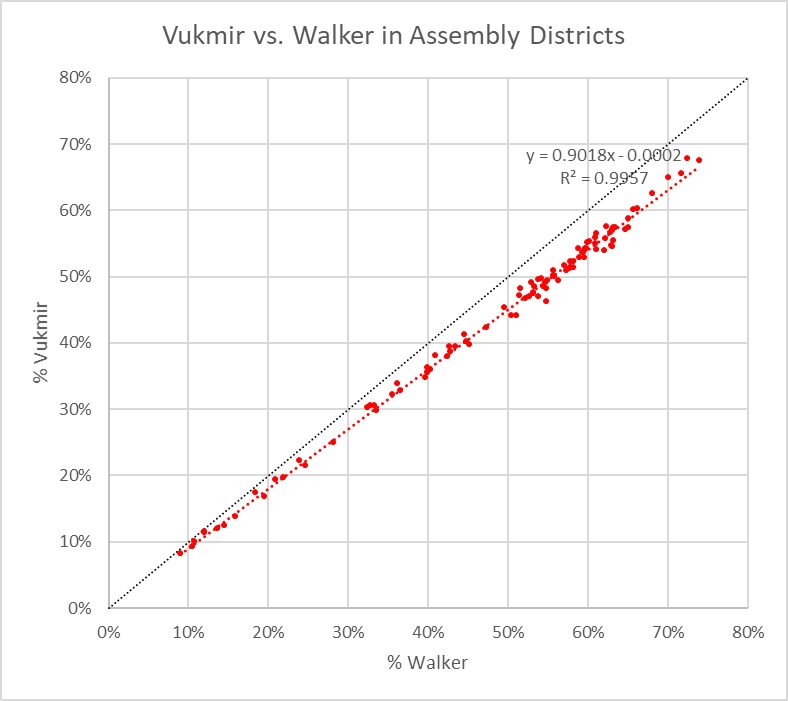 This chart shows that Republican U.S. Senate candidate Leah Vukmir got 90 percent of the Walker vote. The other 10 percent flowed to Baldwin. These percentages are remarkably consistent between districts, regardless of how partisan a district was. This means, of course, the more Republican the district the larger the number of votes for Baldwin from the 10 percent of votes flowing to her from Walker. State legislators are the closest to those we represent. … Citizens from every corner of Wisconsin deserve a strong legislative branch that stands on equal footing with an incoming administration that is based almost solely in Madison. The problem with this argument is that the gerrymander has made the legislature a highly unrepresentative and undemocratic body. Around 52 percent of the electorate—those voting Democratic–has been effectively disenfranchised, with little ability to influence Wisconsin’s laws and policies. Next, sounding very much like a third-world military justifying their coups against a democratically-elected government, Fitzgerald admits that his beef is that the policies of the incoming administration might deviate from those of the outgoing administration. Today’s extraordinary session codifies into law reforms that have been eight years in the making. Law written by the legislature and passed by a governor should not be erased based on the political maneuvering of an incoming administration. “Political maneuvering” is a curious way to describe the change in policies that arise from a democratic election. Apparently, Wisconsin’s biggest cities are inhabited by some inferior species, whose votes should be ignored. Both in the United States and internationally there is growing concern about the future of democracy. A recent issue of the Atlantic magazine was devoted to the issue, with cover headline: “Is Democracy Dying?” In Europe, countries liberated from the Soviet Union, such as Poland and Hungary, seem to be slipping back into totalitarianism. The most recent annual report from Freedom House shows more countries slipping backward than forward. Their concern extends to the United States, both because it has downgraded its historical role as an advocate of democracy under the present president and because of actions similar to those in Wisconsin and other states, notably North Carolina. In addition to using gerrymanders to entrench the governing party and changing laws to handcuff an incoming administration, these include schemes making it harder for opponents’ supporters to register and vote. Given Wisconsin’s historic role as a pioneer in reforms to expand democracy, it is startling to see it singled out as a pioneer in the move towards less democracy. Another excellent analysis by Bruce Thompson. Gerrymandering undermines democracy no mattrer where it is done: Wisconsin, Illinois, Maryland, or North Carolina. Hopefully there is enough concern from at least five judges on the US Supreme Court that this will change.